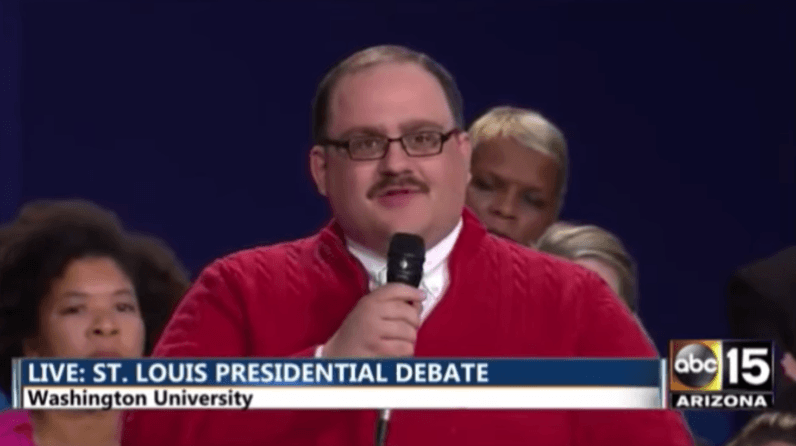 It’s no secret that Ken Bone was the star of the last presidential debate. In the days to follow, Bone has become nothing short of a cultural phenomenon. CamSoda wants to extend his 15 minutes by at least an additional 45, all while fattening his bank account at the same time. If you’ve been hiding under a rock the past few days, Bone is the human embodiment of a hug. His gentle demeanor and timely question surrounding energy use and pollution captivated a nation and now we find ourselves wanting more. CamSoda, an adult entertainment platform for live streaming, knows a thing or two about giving people what they want. The company sent Bone a letter requesting a 60 minute live stream in exchange for $100,000 cash and 25 disposable cameras. While it’s not setting any restrictions on what the show entails, it’s recommending Bone take us all into the Bone Zone for a glimpse at what he’s all about. Being an adult webcam site, I’m really hoping Bone Zone isn’t a euphemism.